Primarily Pearl Harbor, Honolulu, Hawaii, U.S. 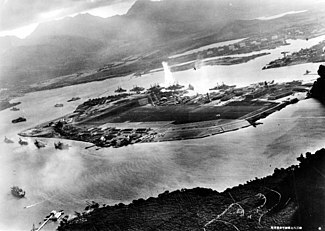 The attack on Pearl Harbor[nb 3] was a surprise military strike by the Imperial Japanese Navy Air Service upon the United States (a neutral country at the time) against the naval base at Pearl Harbor in Honolulu, Hawaii on Sunday morning, December 7, 1941. 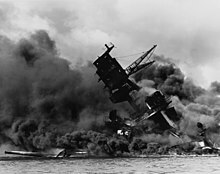 The attack led to the United States' formal entry into World War II the next day. The Japanese military leadership referred to the attack as the Hawaii Operation and Operation AI, and as Operation Z during its planning. Japan intended the attack as a preventive action to keep the United States Pacific Fleet from interfering with its planned military actions in Southeast Asia against overseas territories of the United Kingdom, the Netherlands, and the United States. Over the course of seven hours there were coordinated Japanese attacks on the U.S.-held Philippines, Guam and Wake Island and on the British Empire in Malaya, Singapore, and Hong Kong. Additionally, from the Japanese viewpoint, it was seen as a preemptive strike. The attack commenced at 7:48 a.m. Hawaiian Time (18:18 GMT). [nb 4] The base was attacked by 353 Imperial Japanese aircraft (including fighters, level and dive bombers, and torpedo bombers) in two waves, launched from six aircraft carriers. All eight U.S. Navy battleships were damaged, with four sunk. All but USS Arizona were later raised, and six were returned to service and went on to fight in the war. The Japanese also sank or damaged three cruisers, three destroyers, an anti-aircraft training ship,[nb 5] and one minelayer. 188 U.S. aircraft were destroyed; 2,403 Americans were killed and 1,178 others were wounded. Important base installations such as the power station, dry dock, shipyard, maintenance, and fuel and torpedo storage facilities, as well as the submarine piers and headquarters building (also home of the intelligence section), were not attacked. Japanese losses were light: 29 aircraft and five midget submarines lost, and 64 servicemen killed. One Japanese sailor, Kazuo Sakamaki, was captured. Japan declared war on the United States on December 8 (December 9 in Tokyo). The following day, December 8, Congress declared war on Japan. On December 11, Germany and Italy each declared war on the U.S. The U.S. responded with a declaration of war against Germany and Italy. War between Japan and the United States had been a possibility that each nation had been aware of, and planned for, since the 1920s. The relationship between the two countries was cordial enough that they remained trading partners. Tensions did not seriously grow until Japan's invasion of Manchuria in 1931. Over the next decade, Japan expanded into China, leading to the Second Sino-Japanese War in 1937. Japan spent considerable effort trying to isolate China, and endeavored to secure enough independent resources to attain victory on the mainland. The "Southern Operation" was designed to assist these efforts. Starting in December 1937, events such as the Japanese attack on USS Panay, the Allison incident, and the Nanking Massacre swung Western public opinion sharply against Japan. Fearing Japanese expansion, the United States, United Kingdom, and France assisted China with its loans for war supply contracts. In 1940, Japan invaded French Indochina, attempting to stymie the flow of supplies reaching China. The United States halted shipments of airplanes, parts, machine tools, and aviation gasoline to Japan, which the latter perceived as an unfriendly act. [nb 6] The United States did not stop oil exports, however, partly because of the prevailing sentiment in Washington: given Japanese dependence on American oil, such an action was likely to be considered an extreme provocation. In mid-1940, President Franklin D. Roosevelt moved the Pacific Fleet from San Diego to Hawaii. He also ordered a military buildup in the Philippines, taking both actions in the hope of discouraging Japanese aggression in the Far East. Because the Japanese high command was (mistakenly) certain any attack on the United Kingdom's Southeast Asian colonies, including Singapore, would bring the U.S. into the war, a devastating preventive strike appeared to be the only way to prevent American naval interference. An invasion of the Philippines was also considered necessary by Japanese war planners. The U.S. War Plan Orange had envisioned defending the Philippines with an elite force of 40,000 men; this option was never implemented due to opposition from Douglas MacArthur, who felt he would need a force ten times that size. [self-published source] By 1941, U.S. planners expected to abandon the Philippines at the outbreak of war. Late that year, Admiral Thomas C. Hart, commander of the Asiatic Fleet, was given orders to that effect. The U.S. finally ceased oil exports to Japan in July 1941, following the seizure of French Indochina after the Fall of France, in part because of new American restrictions on domestic oil consumption. Because of this decision, Japan proceeded with plans to take the oil-rich Dutch East Indies. [nb 7] On August 17, Roosevelt warned Japan that America was prepared to take opposing steps if "neighboring countries" were attacked. The Japanese were faced with a dichotomy—either withdraw from China and lose face, or seize new sources of raw materials in the resource-rich European colonies of Southeast Asia. Japan and the U.S. engaged in negotiations during 1941, attempting to improve relations. In the course of these negotiations, Japan offered to withdraw from most of China and Indochina after making peace with the Nationalist government. It also proposed to adopt an independent interpretation of the Tripartite Pact and to refrain from trade discrimination, provided all other nations reciprocated. Washington rejected these proposals. Japanese Prime Minister Konoye then offered to meet with Roosevelt, but Roosevelt insisted on reaching an agreement before any meeting. The U.S. ambassador to Japan repeatedly urged Roosevelt to accept the meeting, warning that it was the only way to preserve the conciliatory Konoye government and peace in the Pacific. However, his recommendation was not acted upon. The Konoye government collapsed the following month, when the Japanese military rejected a withdrawal of all troops from China. Japan's final proposal, delivered on November 20, offered to withdraw from southern Indochina and to refrain from attacks in Southeast Asia, so long as the United States, United Kingdom, and Netherlands ceased aid to China and lifted their sanctions against Japan. The American counter-proposal of November 26 (November 27 in Japan), the Hull note, required Japan completely evacuate China without conditions and conclude non-aggression pacts with Pacific powers. On November 26 in Japan, the day before the note's delivery, the Japanese task force left port for Pearl Harbor. The Japanese intended the attack as a preventive action to keep the United States Pacific Fleet from interfering with its planned military actions in Southeast Asia against overseas territories of the United Kingdom, the Netherlands, and the United States. Over the course of seven hours there were coordinated Japanese attacks on the U.S.-held Philippines, Guam and Wake Island and on the British Empire in Malaya, Singapore, and Hong Kong. Additionally, from the Japanese viewpoint, it was seen as a preemptive strike 'before the oil gauge ran empty'. Over the next several months, pilots were trained, equipment was adapted, and intelligence was collected. Despite these preparations, Emperor Hirohito did not approve the attack plan until November 5, after the third of four Imperial Conferences called to consider the matter. Final authorization was not given by the emperor until December 1, after a majority of Japanese leaders advised him the "Hull Note" would "destroy the fruits of the China incident, endanger Manchukuo and undermine Japanese control of Korea." On November 26, 1941, a Japanese task force (the Striking Force) of six aircraft carriers—Akagi, Kaga, Sōryū, Hiryū, Shōkaku, and Zuikaku—departed Hittokapu Bay on Kasatka (now Iterup) Island in the Kurile Islands, en route to a position northwest of Hawaii, intending to launch its 408 aircraft to attack Pearl Harbor: 360 for the two attack waves and 48 on defensive combat air patrol (CAP), including nine fighters from the first wave. Before the attack commenced, the Imperial Japanese Navy launched reconnaissance floatplanes from cruisers Chikuma and Tone, one to scout over Oahu and the other over Lahaina Roads, Maui, respectively, with orders to report on U.S. fleet composition and location. Reconnaissance aircraft flights risked alerting the U.S., and were not necessary. U.S. fleet composition and preparedness information in Pearl Harbor were already known due to the reports of the Japanese spy Takeo Yoshikawa. A report of the absence of the U.S. fleet in Lahaina anchorage off Maui was received from the Tone's floatplane and fleet submarine I-72. Another four scout planes patrolled the area between the Japanese carrier force (the Kidō Butai) and Niihau, to detect any counterattack. Fleet submarines I-16, I-18, I-20, I-22, and I-24 each embarked a Type A midget submarine for transport to the waters off Oahu. The five I-boats left Kure Naval District on November 25, 1941. On December 6, they came to within 10 nmi (19 km; 12 mi) of the mouth of Pearl Harbor and launched their midget subs at about 01:00 local time on December 7. At 03:42 Hawaiian Time, the minesweeper Condor spotted a midget submarine periscope southwest of the Pearl Harbor entrance buoy and alerted the destroyer Ward. The midget may have entered Pearl Harbor. However, Ward sank another midget submarine at 06:37[nb 10] in the first American shots in the Pacific Theater. A midget submarine on the north side of Ford Island missed the seaplane tender Curtiss with her first torpedo and missed the attacking destroyer Monaghan with her other one before being sunk by Monaghan at 08:43. The attack took place before any formal declaration of war was made by Japan, but this was not Admiral Yamamoto's intention. He originally stipulated that the attack should not commence until thirty minutes after Japan had informed the United States that peace negotiations were at an end. However, the attack began before the notice could be delivered. Tokyo transmitted the 5000-word notification (commonly called the "14-Part Message") in two blocks to the Japanese Embassy in Washington. Transcribing the message took too long for the Japanese ambassador to deliver it on schedule; in the event, it was not presented until more than an hour after the attack began. (In fact, U.S. code breakers had already deciphered and translated most of the message hours before he was scheduled to deliver it.) The final part is sometimes described as a declaration of war. While it was viewed by a number of senior U.S government and military officials as a very strong indicator negotiations were likely to be terminated and that war might break out at any moment, it neither declared war nor severed diplomatic relations. A declaration of war was printed on the front page of Japan's newspapers in the evening edition of December 8, but not delivered to the U.S. government until the day after the attack. For decades, conventional wisdom held that Japan attacked without first formally breaking diplomatic relations only because of accidents and bumbling that delayed the delivery of a document hinting at war to Washington. In 1999, however, Takeo Iguchi, a professor of law and international relations at International Christian University in Tokyo, discovered documents that pointed to a vigorous debate inside the government over how, and indeed whether, to notify Washington of Japan's intention to break off negotiations and start a war, including a December 7 entry in the war diary saying, "[O]ur deceptive diplomacy is steadily proceeding toward success." Of this, Iguchi said, "The diary shows that the army and navy did not want to give any proper declaration of war, or indeed prior notice even of the termination of negotiations ... and they clearly prevailed." In the first wave attack, about eight of the forty-nine 800 kg (1760 lb) armor-piercing bombs dropped hit their intended battleship targets. At least two of those bombs broke up on impact, another detonated before penetrating an unarmored deck, and one was a dud. Thirteen of the forty torpedoes hit battleships, and four torpedoes hit other ships. Men aboard U.S. ships awoke to the sounds of alarms, bombs exploding, and gunfire, prompting bleary-eyed men to dress as they ran to General Quarters stations. (The famous message, "Air raid Pearl Harbor. This is not drill. ",[nb 14] was sent from the headquarters of Patrol Wing Two, the first senior Hawaiian command to respond.) The defenders were very unprepared. 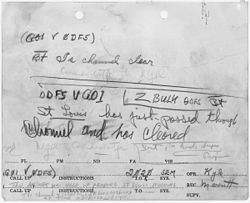 Ammunition lockers were locked, aircraft parked wingtip to wingtip in the open to prevent sabotage, guns unmanned (none of the Navy's 5"/38s, only a quarter of its machine guns, and only four of 31 Army batteries got in action). Despite this low alert status, many American military personnel responded effectively during the attack. [nb 15] Ensign Joe Taussig Jr., aboard Nevada, commanded the ship's antiaircraft guns and was severely wounded, but continued to be on post. Lt. Commander F. J. Thomas commanded Nevada in the captain's absence and got her under way until the ship was grounded at 9:10 a.m. One of the destroyers, Aylwin, got underway with only four officers aboard, all ensigns, none with more than a year's sea duty; she operated at sea for 36 hours before her commanding officer managed to get back aboard. Captain Mervyn Bennion, commanding West Virginia, led his men until he was cut down by fragments from a bomb which hit Tennessee, moored alongside. Ninety minutes after it began, the attack was over. 2,008 sailors were killed, and 710 others wounded; 218 soldiers and airmen (who were part of the Army prior to the independent United States Air Force in 1947) were killed and 364 wounded; 109 marines were killed and 69 wounded; and 68 civilians were killed and 35 wounded. In total, 2,403 Americans were killed and 1,143 were wounded. Eighteen ships were sunk or run aground, including five battleships. All of the Americans killed or wounded during the attack were non-combatants, given the fact there was no state of war when the attack occurred. Among the notable civilian casualties were nine Honolulu Fire Department (HFD) firefighters who responded to Hickam Field during the bombing in Honolulu, becoming the only fire department on American soil to be attacked by a foreign power in history. Fireman Harry Tuck Lee Pang of Engine 6 was killed near the hangers by machine gun fire from a Japanese plane. Captains Thomas Macy and John Carreira of Engine 4 and Engine 1 respectively died while battling flames inside the hanger after a Japanese bomb crashed through the roof. An additional six firefighters were wounded from Japanese shrapnel. The wounded later received Purple Hearts (originally reserved for service members wounded by enemy action while partaking in armed conflicts) for their peacetime heroism that day on June 13, 1944; the three firefighters killed did not receive theirs until on December 7, 1984 at the 43rd anniversary of the attack. This made the nine men the only non-military firefighters to receive such award in U.S. history. Already damaged by a torpedo and on fire amidships, Nevada attempted to exit the harbor. She was targeted by many Japanese bombers as she got under way and sustained more hits from 250 lb (113 kg) bombs, which started further fires. She was deliberately beached to avoid blocking the harbor entrance. California was hit by two bombs and two torpedoes. The crew might have kept her afloat, but were ordered to abandon ship just as they were raising power for the pumps. Burning oil from Arizona and West Virginia drifted down on her, and probably made the situation look worse than it was. The disarmed target ship Utah was holed twice by torpedoes. West Virginia was hit by seven torpedoes, the seventh tearing away her rudder. Oklahoma was hit by four torpedoes, the last two above her belt armor, which caused her to capsize. Maryland was hit by two of the converted 16" shells, but neither caused serious damage. USS West Virginia was sunk by six torpedoes and two bombs during the attack. Fifty-five Japanese airmen and nine submariners were killed in the attack, and one, Kazuo Sakamaki, was captured. Of Japan's 414 available planes, 29 were lost during the battle (nine in the first attack wave, 20 in the second),[nb 17] with another 74 damaged by antiaircraft fire from the ground. American anti-aircraft performance had improved considerably during the second strike, and two thirds of Japan's losses were incurred during the second wave. Nagumo felt if he launched a third strike, he would be risking three quarters of the Combined Fleet's strength to wipe out the remaining targets (which included the facilities) while suffering higher aircraft losses. A third wave would have required substantial preparation and turnaround time, and would have meant returning planes would have had to land at night. At the time, only the Royal Navy had developed night carrier techniques, so this was a substantial risk. At a conference aboard his flagship the following morning, Yamamoto supported Nagumo's withdrawal without launching a third wave. In retrospect, sparing the vital dockyards, maintenance shops, and the oil tank farm meant the U.S. could respond relatively quickly to Japanese activities in the Pacific. Yamamoto later regretted Nagumo's decision to withdraw and categorically stated it had been a great mistake not to order a third strike. Twenty-one ships were damaged or lost in the attack, of which all but three were repaired and returned to service. Helm: underway to West Loch, damaged by two near-miss bombs; continued patrol; dry-docked 15 January 1942 and sailed 20 January 1942. Sotoyomo (harbor tug): damaged by explosion and fires in Shaw; sunk; returned to service August 1942. YFD-2 (yard floating dock): damaged by 250 kg bombs; sunk; returned to service 25 January 1942 servicing Shaw. 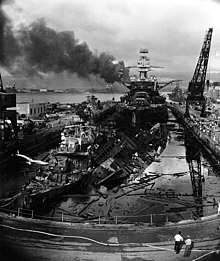 Around Pearl Harbor, divers from the Navy (shore and tenders), the Pearl Harbor Naval Shipyard, and civilian contractors (Pacific Bridge and others) began work on the ships that could be refloated. They patched holes, cleared debris, and pumped water out of ships. Navy divers worked inside the damaged ships. Within six months, five battleships and two cruisers were patched or refloated so they could be sent to shipyards in Pearl Harbor and on the mainland for extensive repair. 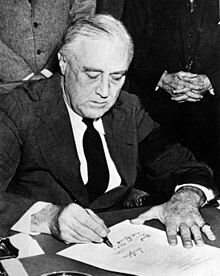 The day after the attack, Roosevelt delivered his famous Infamy Speech to a Joint Session of Congress, calling for a formal declaration of war on the Empire of Japan. Congress obliged his request less than an hour later. On December 11, Germany and Italy declared war on the United States, even though the Tripartite Pact did not require it. [nb 20] Congress issued a declaration of war against Germany and Italy later that same day. The UK actually declared war on Japan nine hours before the U.S. did, partially due to Japanese attacks on Malaya, Singapore and Hong Kong, and partially due to Winston Churchill's promise to declare war "within the hour" of a Japanese attack on the United States. The attack also had international consequences. The Canadian province of British Columbia, bordering the Pacific Ocean, had long had a large population of Japanese immigrants and their Japanese Canadian descendants. Pre-war tensions were exacerbated by the Pearl Harbor attack, leading to a reaction from the Government of Canada. On February 24, 1942, Order-in-Council P.C. no. 1486 was passed under the War Measures Act allowing for the forced removal of any and all Canadians of Japanese descent from British Columbia, as well as the prohibiting them from returning to the province. On 4 March, regulations under the Act were adopted to evacuate Japanese-Canadians. As a result, 12,000 were interned in interior camps, 2,000 were sent to road camps and another 2,000 were forced to work in the prairies at sugar beet farms. Admiral Hara Tadaichi summed up the Japanese result by saying, "We won a great tactical victory at Pearl Harbor and thereby lost the war." To a similar effect, see Isoroku Yamamoto's alleged "sleeping giant" quote. While the attack accomplished its intended objective, it turned out to be largely unnecessary. Unbeknownst to Yamamoto, who conceived the original plan, the U.S. Navy had decided as far back as 1935 to abandon 'charging' across the Pacific towards the Philippines in response to an outbreak of war (in keeping with the evolution of Plan Orange). The U.S. instead adopted "Plan Dog" in 1940, which emphasized keeping the IJN out of the eastern Pacific and away from the shipping lanes to Australia, while the U.S. concentrated on defeating Nazi Germany. Fortunately for the United States, the American aircraft carriers were untouched by the Japanese attack; otherwise the Pacific Fleet's ability to conduct offensive operations would have been crippled for a year or more (given no diversions from the Atlantic Fleet). As it was, the elimination of the battleships left the U.S. Navy with no choice but to rely on its aircraft carriers and submarines—the very weapons with which the U.S. Navy halted and eventually reversed the Japanese advance. While six of the eight battleships were repaired and returned to service, their relatively low speed and high fuel consumption limited their deployment, and they served mainly in shore bombardment roles (their only major action being the Battle of Surigao Strait in October 1944). A major flaw of Japanese strategic thinking was a belief that the ultimate Pacific battle would be fought by battleships, in keeping with the doctrine of Captain Alfred Thayer Mahan. As a result, Yamamoto (and his successors) hoarded battleships for a "decisive battle" that never happened. The Japanese confidence in their ability to win a quick victory meant that they neglected Pearl Harbor's navy repair yards, oil tank farms, submarine base, and old headquarters building. All of these targets were omitted from Genda's list, yet they proved more important than any battleship to the American war efforts in the Pacific. The survival of the repair shops and fuel depots allowed Pearl Harbor to maintain logistical support to the U.S. Navy's operations, such as the Doolittle Raid and the Battles of Coral Sea and Midway. It was submarines that immobilized the Imperial Japanese Navy's heavy ships and brought Japan's economy to a virtual standstill by crippling the transportation of oil and raw materials: by the end of 1942, import of raw materials was cut to half of what it had been, "to a disastrous ten million tons", while oil import "was almost completely stopped". [nb 21] Lastly, the basement of the Old Administration Building was the home of the cryptanalytic unit which contributed significantly to the Midway ambush and the Submarine Force's success. ^ USCGC Taney (WHEC-37), USCGC Reliance (WSC-150), USCGC Tiger (WSC-152). ^ Unless otherwise stated, all vessels listed were salvageable. ^ a b In 1941, Hawaii was a half-hour different from the majority of other time zones. See UTC−10:30. ^ USS Utah (AG-16, formerly BB-31); Utah was moored in the space intended to have been occupied by the aircraft carrier Enterprise which, returning with a task force, had been expected to enter the channel at 0730 on December 7; delayed by weather, the task force did not reach Pearl Harbor until dusk the following day. ^ After it was announced in September that iron and steel scrap export would also be prohibited, Japanese Ambassador Horinouchi protested to Secretary Hull on October 8, 1940, warning this might be considered an "unfriendly act." ^ This was mainly a Japanese Navy preference; the Japanese Army would have chosen to attack the Soviet Union. ^ "The Dorn report did not state with certainty that Kimmel and Short knew about Taranto. There is, however, no doubt that they did know, as did the Japanese. Lt. Cdr. 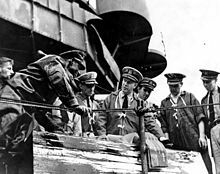 Takeshi Naito, the assistant naval attaché to Berlin, flew to Taranto to investigate the attack first hand, and Naito subsequently had a lengthy conversation with Cdr. Mitsuo Fuchida about his observations. Fuchida led the Japanese attack on December 7, 1941." ^ "A torpedo bomber needed a long, level flight, and when released, its conventional torpedo would plunge nearly a hundred feet deep before swerving upward to strike a hull. Pearl Harbor deep averages 42 feet. But the Japanese borrowed an idea from the British carrier-based torpedo raid on the Italian naval base of Taranto. They fashioned auxiliary wooden tail fins to keep the torpedoes horizontal, so they would dive to only 35 feet, and they added a breakaway "nosecone" of soft wood to cushion the impact with the surface of the water." ^ She was located by a University of Hawaii research submersible on August 28, 2002 in 400 m (1,300 ft) of water, 6 nmi (11 km) outside the harbor. ^ While the nine sailors who died in the attack were quickly lionized by the Japanese government as Kyūgunshin ("The Nine War Heroes"), the news of Sakamaki's capture, which had been publicized in U.S. news broadcasts, was kept secret. Even after the war, however, he received recriminating correspondence from those who despised him for not sacrificing his own life. ^ The Japanese Attack on Pearl Harbor, Planning and Execution. First wave: 189 planes, 50 Kates w/bombs, 40 Kates with torpedoes, 54 Vals, 45 Zekes Second wave: 171 planes, 54 Kates w/bombs, 81 Vals, 36 Zekes. The Combat Air Patrol over the carriers alternated 18 plane shifts every two hours, with 18 more ready for takeoff on the flight decks and an additional 18 ready on hangar decks. ^ In the twenty-five sorties flown, USAF Historical Study No.85 credits six pilots with ten planes destroyed: 1st Lt Lewis M. Sanders (P-36) and 2nd Lts Philip M Rasmussen (P-36), Gordon H. Sterling Jr. (P-36, killed in action), Harry W. Brown (P-36), Kenneth M. Taylor (P-40, 2), and George S. Welch (P-40, 4). Three of the P-36 kills were not verified by the Japanese and may have been shot down by naval anti-aircraft fire. ^ Odd though it may sound, "not" is correct, in keeping with standard Navy telegraphic practice. This was confirmed by Beloite and Beloite after years of research and debate. ^ The gunners that did get in action scored most of the victories against Japanese aircraft that morning, including the first of the attack by Tautog, and Dorie Miller's Navy Cross-worthy effort. Miller was an African-American cook aboard West Virginia who took over an unattended anti-aircraft gun on which he had no training. He was the first African-American sailor to be awarded the Navy Cross. ^ The wreck has become a memorial to those lost that day, most of whom remain within the ship. She continues to leak small amounts of fuel oil, over 70 years after the attack. ^ USAAF pilots of the 46th and 47th Pursuit Squadrons, 15th Pursuit Group, claim to have destroyed 10. ^ In the event, loss of these might have been a net benefit to the U.S. Blair, passim. ^ Wallin had been assigned to go to Massawa in East Africa. The harbor there was blocked by scuttled Italian and German ships, which prevented British use of the port. Commander Edward Ellsberg was sent instead. ^ The pact had one of its objectives limiting U.S. intervention in conflicts involving the three nations. ^ In less than eleven months, most of Japan's elite naval aviators who had been at Pearl Harbor were lost in subsequent battles. Lack of fuel and an inflexible training policy meant that they could not be replaced. ^ Gordon Prange specifically addresses some revisionist works, including Charles A. Beard. President Roosevelt and the Coming War 1941; William Henry Chamberlin, America's Second Crusade; John T. Flynn, The Roosevelt Myth; George Morgenstern, Pearl Harbor; Frederic R. Sanborn, Design for War; Robert Alfred Theobald, The Final Secret of Pearl Harbor; Harry E. Barnes, ed., Perpetual War for Perpetual Peace and The Court Historians versus Revisionism; Husband E. Kimmel, Admiral Kimmel's Story." ^ "The Long Blue Line: The attack on Pearl Harbor—"a date that will live in infamy"". coastguard.dodlive.mil. Retrieved December 8, 2017. ^ "U.S. COAST GUARD UNITS IN HAWAII" (PDF). media.defense.gov. Retrieved December 8, 2017. ^ "Active Class, U.S. Coast Guard Cutters". pwencycl.kgbudge.com. Retrieved December 8, 2017. ^ "Ships and District Craft Present at Pearl Harbor, 0800 7 December 1941 U.S. Navy Historical Center". History.navy.mil. Archived from the original on July 10, 2011. Retrieved July 5, 2015. ^ CinCP report of damage to ships in Pearl Harbor from ibiblio.org/hyperwar. ^ "Overview of The Pearl Harbor Attack, 7 December 1941". Archived from the original on August 6, 2010. Retrieved October 5, 2014. ^ Gilbert 2009, p. 272. ^ "Pearl Harbor Casualty List". USSWestVirginia.org. Retrieved December 7, 2012. ^ Prange, Gordon W., Goldstein, Donald, & Dillon, Katherine. The Pearl Harbor Papers (Brassey's, 2000), p. 17ff; Google Books entry on Prange et al. ^ For the Japanese designator of Oahu. Wilford, Timothy. "Decoding Pearl Harbor", in The Northern Mariner, XII, #1 (January 2002), p. 32fn81. ^ a b Gill, G. Hermon (1957). Royal Australian Navy 1939–1942. Australia in the War of 1939–1945. Series 2 – Navy. 1. Canberra: Australian War Memorial. p. 485. LCCN 58037940. Archived from the original on May 25, 2009. Retrieved June 16, 2015. ^ a b c Worth, Roland H., Jr. (January 27, 2014). No Choice but War: The United States Embargo Against Japan and the Eruption of War in the Pacific. Jefferson, North Carolina: McFarland, Incorporated. ISBN 0786477520. ISBN 9780786477524. ^ a b Prange et al. December 7, 1941, p. 174. ^ Thomas 2007, pp. 57–59. ^ "Pearl Harbor Facts". About. Retrieved October 5, 2014. ^ David M. Kennedy and Lizabeth Cohen, American Pageant: Vol 2 (13th Edition, 2006) p 820. ^ a b Yuma Totani (April 1, 2009). The Tokyo War Crimes Trial: The Pursuit of Justice in the Wake of World War II. Harvard University Asia Center. p. 57. ^ a b Stephen C. McCaffrey (September 22, 2004). Understanding International Law. AuthorHouse. pp. 210–229. ^ Shift Of Our Fleet To Atlantic Studied, New York Times, June 23, 1940, "Except for the Atlantic Battle Squadron, the entire fleet is now in the Pacific, based at Pearl Harbor, Hawaii." ^ Harper, Tim (September 7, 2009). "Japan's gigantic second world war gamble". The Guardian. ISSN 0261-3077. Retrieved December 7, 2016. ^ a b Peattie 1997; Coox, Kobun. ^ Lord, Walter (2012). Day of Infamy. Open Road Media. p. 14. ISBN 1-4532-3842-5. ^ Borch & Martinez 2005, pp. 53–54. ^ Wetzler 1998, p. 39. ^ The Canadian Institute of Public Opinion (December 8, 1941). "Gallup Poll Found 52 p.c. of Americans Expected War". Ottawa Citizen. p. 1. Retrieved November 28, 2011. ^ a b Willmott 1983, p. 14. ^ Peattie 2001 p. 145. ^ Bjorkman, James, "December 7, 1941: Japanese Attack Pearl Harbor," Filminspector.com, Retrieved 3 March 2019. ^ a b c Tony DiGiulian. "Order of Battle – Pearl Harbor – December 7, 1941". Navweaps.com. Archived from the original on June 30, 2011. Retrieved July 17, 2011. ^ "Japanese Midget Submarine". Retrieved January 20, 2014. ^ "When was Pearl Harbor? - History". History. November 26, 2014. Retrieved August 17, 2018. ^ Declaration of War handout Retrieved August 9, 2012. ^ a b c d e "Aircraft Attack Organization". Ibiblio.org. Archived from the original on June 23, 2011. Retrieved July 17, 2011. ^ Evans, Harold. The American Century London: Jonathan Cape, 1998. p. 309. ^ a b Prange et al., At Dawn We Slept, p. 500-501. ^ Symonds, Craig L. The Battle Of Midway, (Oxford University Press, 2011), p. 218. ^ Hone, Thomas C. (1977). "The Destruction of the Battle Line at Pearl Harbor". Proceedings. United States Naval Institute. 103 (12): 56&57. ^ Aylwin, Dictionary of American Naval Fighting Ships. ^ "How many people died at Pearl Harbor during the attack? - Visit Pearl Harbor". visitpearlharbor.org. Retrieved August 17, 2018. ^ Dennis W. Shepherd (September 22, 2004). Returning Son: From Baghdad, Kentucky to Baghdad, Iraq (and back). AuthorHouse. p. 57. ^ Chad Stewart (December 1, 2018). "9 Things You Might Not Know About the Attack on Pearl Harbor". United Service Organizations. ^ Paul Hashgen (November 1, 2011). "Fire History: Dec. 7, 1941: A Day of Infamy And Fire". Firehouse. ^ Dorr, Robert F.; Fred L. Borch. "Pyjama-clad pilot took on Japanese at Pearl Harbor". Army Times. United States Army. Retrieved October 12, 2010. ^ "HyperWar: 7 December 1941: The Air Force Story [Chapter 4]". Ibiblio.org. Retrieved July 10, 2013. ^ Potter, Lt Col Joseph V. (Winter 1982). "A Handful of Pilots" (PDF). JOURNAL. American Aviation Historical Society. pp. 282–285. Retrieved October 12, 2010. ^ Patrick Watson (December 1, 2007). Watson's Really Big WWII Almanac, Volume 2: July to December. Xlibris Corporation. p. 592. ^ Caravaggio, Angelo N. (Winter 2014). ""Winning" the Pacific War". Naval War College Review. 67 (1): 85–118. Archived from the original on July 14, 2014. ^ Willmott 1983, p. 16. ^ Wallin, Homer N. (1968). Pearl Harbor: Why, How, Fleet Salvage and Final Appraisal (PDF). Naval History Division. p. 198. ^ Wallin, Homer N. (1968). Pearl Harbor: Why, How, Fleet Salvage and Final Appraisal (PDF). Naval History Division. p. 205. ^ Commander Edward Ellsberg, O.B.E. Under the Red Sea Sun Dodd, Mead, and Co., 1946. ^ Raymer, E.C. Descent Into Darkness. Presidio Press, 1996. ^ "Post-attack ship salvage 1942–1944". Geocities. October 27, 2009. Archived from the original on October 27, 2009. Retrieved July 17, 2011. ^ Smith 1999, p. [page needed]. ^ "The U.S. At War, The Last Stage". Time. December 15, 1941. ^ "World War II Internment in Hawai'i". Education through Cultural & Historical Organizations. Archived from the original on August 12, 2011. Retrieved November 13, 2011. ^ Levine, E. (1995). A Fence Away from Freedom: Japanese Americans and World War II. New York: G.P. Putnam's Sons. ^ "Archived copy". Archived from the original on December 1, 2011. Retrieved November 13, 2011. CS1 maint: Archived copy as title (link) Pearl Harbor Oahu website, retrieved on November 12, 2011. ^ Daniels, R. (1972). Concentration camps USA: Japanese Americans and World War II. New York: Holt, Rinehart and Winston, Inc.
^ "New Mexico Office of the State Historian – people". ^ War Measures Act Conference (1977: McMaster University). (1978). The Japanese Canadian experience: the October crisis [proceedings]. Wilfrid Laurier University Book Shelves: London, Ontario: P. Anas Pub. pp. 12–14. ^ Haufler, Herve. Codebreaker's Victory: How the Allied Cryptographers Won World War II (New York: NAL, 2003), quoted p. 127. ^ "Attack on Pearl Harbor | Nihon Kaigun". Combinedfleet.com. Retrieved March 6, 2014. ^ "Pearl Harbor vet remembers Dec. 7, 1941, sneak attack". The Kalona News. April 17, 2013. Retrieved March 6, 2014. ^ Wallin, Vice Admiral, Homer N. (July 2, 2017). "Pearl Harbor: Why, How, Fleet Salvage and Final Appraisal". Hyperwar. ^ Prange, Gordon W.; Donald M. Goldstein; Katherinve V. Dillon (1991). Pearl Harbor: The Verdict of History. Penguin Books. ISBN 978-0140159097. ^ Prados, John (1995). Combined Fleet Decoded: The Secret History of American Intelligence and the Japanese Navy in World War II. Annapolis, Maryland: Naval Institute Press. pp. 161–177. ISBN 1-55750-431-8. ^ Budiansky, Stephen (2002). Battle of Wits: The Complete Story of Codebreaking in World War II. Free Press. ISBN 978-0743217347. ^ Stevenson, Richard W. "New Light Shed on Churchill and Pearl Harbor". The New York Times. Retrieved March 4, 2014. ^ Prange, Gordon W.; Goldstein, Donald M.; Dillon, Katherine V. (1991). At Dawn We Slept: The Untold Story of Pearl Harbor. New York: Penguin Books. p. 867. ISBN 9780140157345. Prange, Gordon William; Goldstein, Donald M.; Dillon, Katherine V. (1988). 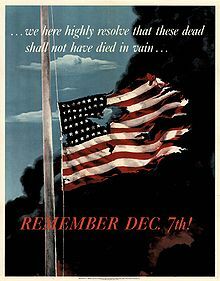 December 7, 1941: The Day the Japanese Attacked Pearl Harbor. McGraw-Hill. ISBN 978-0-07-050682-4. Henry C. Clausen and Bruce Lee, Pearl Harbor: Final Judgment, (HarperCollins, 2001), an account of the secret "Clausen Inquiry" undertaken late in the war by order of Congress to Secretary of War Henry L. Stimson. Clausen was given the authority to go anywhere and question anyone under oath. Ultimately, he traveled more than 55,000 miles and interviewed over a hundred US and British Army, Navy, and civilian personnel, in addition to being given access to all relevant Magic intercepts. Andrew Krepinevich. "Lighting the Path Ahead: Field Exercises and Transformation (186 KB)" (PDF). Archived from the original (PDF) on July 13, 2007. Retrieved January 5, 2017. (Center for Strategic and Budgetary Assessments) contains a passage regarding the Yarnell attack, as well as reference citations. Haynok, Robert J. (2009). How the Japanese Did It. Naval History Magazine. 23. United States Naval Institute. LTC Jeffrey J. Gudmens; COL Timothy R. Reese (2009). Staff Ride Handbook for the Attack on Pearl Harbor, 7 December 1941: A Study of Defending America (PDF) (Report). Combat Studies Institute.